The Drummond Estate, a local family trust, and partner Landchain have submitted a major planning application for a £90 million logistics hub which will also deliver the Enderby Relief Road, diverting traffic around the village of Enderby. The 30-hectare site is close to Junction 21 of the M1 and lies to the east of the M1 and south west of the Enderby Park and Ride. The site is allocated in Blaby District Council’s adopted Local Plan for employment use. The proposals would create 2,000 new jobs and hundreds of skills and training opportunities. It would create a new logistics destination with 106,500 sq m (1,147m sq ft) of advanced warehouse and distribution space and provides for a specialised Logistics Training Centre, which would assist in plugging the growing skills-gap for high tech logistics employees across the region. The development proposes buildings ranging from 14,000 sq m to 46,000 sq m, with the flexibility to further sub-divide plots to suit individual occupier’s needs. The development aims to set new environmental standards for industrial development in the region. Martin Ward on behalf of The Drummond Estate, said: “We are delighted the plans are now ready for submission. 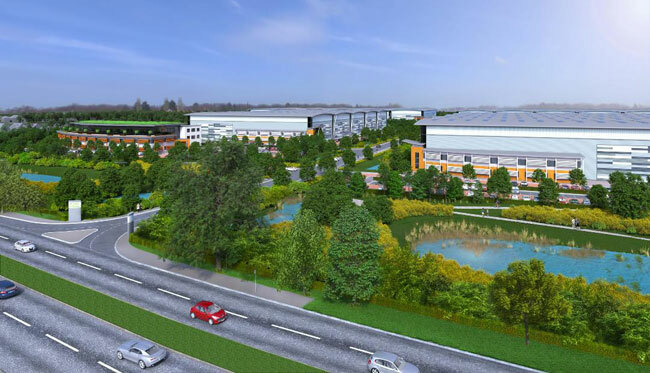 Our proposals support the Council’s allocation of this site for employment uses in its recently adopted Local Plan and represent a considerable investment of £90million to deliver high quality commercial space. “The new development will create thousands of local jobs and we hope the Training Centre will assist those looking to upskill within today’s high-tech logistics sector. It will also deliver the Enderby Relief Road around the village which has been a long-held ambition of the authorities and many local people." Ben Grinnall for Landchain said “These proposals represent an exciting new phase in the growth of logistics facilities in the region. Logistics is a fast growing and rapidly changing sector that helps underpin our economy. The Enderby Logistics Hub is an excellent opportunity to attract high quality businesses to the area and help consolidate the location as the heart of the industry." The Enderby Relief Road (ERR) will deliver a new route from Mill Hill, north of Enderby village, through the New Lubbesthorpe Strategic Employment Site, to Leicester Lane. It would divert vehicles away from the congested village of Enderby, and benefit the wider road network. The access to Leicester Lane and the B4114 junction have already been completed recently. The logistics sector is fast-growing and becoming increasingly more technologically sophisticated, it already accounts for more than a tenth of jobs in the region and, with a large workforce in the area, the Hub offers an ideal location for further growth in the sector with benefits to the wider economy. The planning applications for the Enderby Logistics Hub and the Enderby Relief Road were submitted on February 18th and the local authority will now consider the applications with a decision on the applications due by Summer 2019.